LED signages are the simplest method of improving selling products or making advertisements. 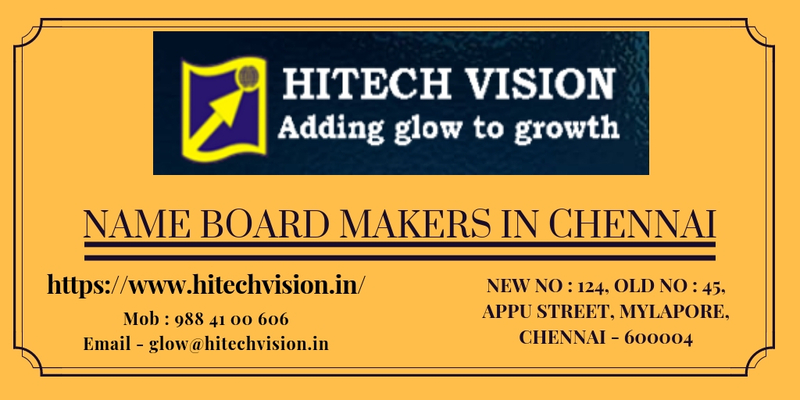 It is easy to modify the display content and also it is cost-effective, low power consumption & there are many more factors which makes LED sign boards produced by Sign Board Manufacturers in Chennai a favorite choice among the business and marketing persons. Let us view the other factors that contribute LED displays an edge over the other product. You should have come across some signboards which intermittently glow & some glow continuously, giving an engaging impression of the business. The LED sign boards manufactured by Name Board Makers in Chennai provides more possibilities for extending a remarkable image of your marketing and business products. Not only a changeless but you also make adjustments to rotate a set of words on the same board at interims, the LED Sign Boards in Chennai also authorize the owners to make modifications in the content without any external guidance. Cost effective: Not only the signages are long-lasting but they also utilize lesser energy as related to the traditional bulbs. The LED bulbs which naturally emit cooler light will not heat up the surroundings & it uses lesser electricity. For further details, you can visit Metal Letters Chennai. ← Looking for a reliable Sign Board Manufacturers for your Company?